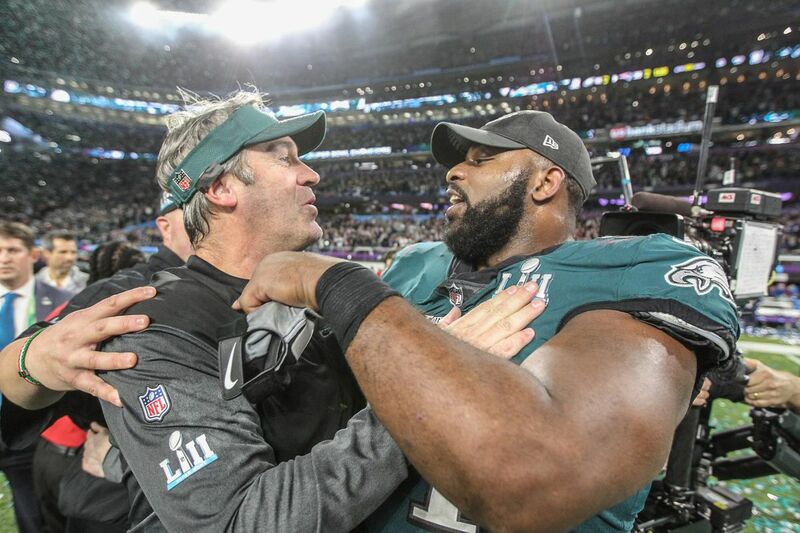 Doug Pederson celebrates with defensive tackle Fletcher Cox after the victory. MINNEAPOLIS — This was Reverend Doug, preaching to the flock. This was Poppa Doug, celebrating with his family. This was something we rarely see. In the locker room, removed from the crowd and confetti and the giddy Eagles fans, coach Doug Pederson convened his Super Bowl LII championship team for one more heartfelt speech, man-to-men. He'd issued this sermon 15 times this season. "Are we done?!" he'd holler, after each Eagles win in the regular season and after both of their playoff wins. This time, the players had a different "Amen." "Are we done?" he cried, his silver hair peeking impishly over his trademark visor as he stood in the middle of the room. Fifteen times before, they had responded with a hearty "No!" The players erupted. They had conquered the Evil Empire as the first team to be top-seeded underdogs throughout the playoffs. They were slated to lose by 4 1/2 points, but they'd won by eight, 41-33. They denied another title to Boston, a town simply spoiled by success over the past two decades. That included Super Bowl XXIX, against the Eagles, in which, we later learned, the Patriots probably cheated. The Eagles brought a Super Bowl title to a franchise that had failed twice before. They supplied a salvation of sorts to a city that hadn't been on top of the NFL in 52 seasons — or, eight years before Pederson was born. They did it without seven of their top 26 players, including franchise quarterback Carson Wentz, who was lost in Game 13 to a knee injury that appeared to doom their hopes. Then Nick Foles turned into Joe Montana and was the Super Bowl MVP, and Pederson and the rest of the underdogs were top dogs, and Pederson could not contain his love. "I'm so happy for every single one of you. Coaches. Players. Mr. Lurie. The organization. Everything you guys have put yourself through from Day One … the injures … you battled through adversity," Pederson said, then continued: "Guys … I… I … I can't tell you how happy I am," Pederson said. "You are world champions. You are world champions." Team owner Jeffery Lurie, who bought the team stood nearby, the dream he dreamt since he bought the team in 1994 — realized, his strategies fully vindicated. General manager Howie Roseman stood on an equipment case, because, well, that's how Howie rolls. "Just look around. OK, this is what you guys have done. This is what you have accomplished." This is what professionalism begets. "You guys get on me a lot about dress code, and 'Win practice.' Well, guess what? It's for this moment right here," Pederson said. "It's the discipline that it takes to win this game. It's a team game," he said, and then, things got real. "I've said before: An individual can make a difference. But a team makes …"
"A miracle," they replied, somberly. They believe this to the marrow of their bones. And then, Pederson said: "We are going to party!" Malcolm Jenkins, the undisputed team leader, who won a Super Bowl as a rookie with Drew Brees in New Orleans, took his turn beside Pederson. "I've been in the league for nine years," said Jenkins, who paid less attention than his coach to grammar and cleanliness, "and I ain't never been with nothing like this." Defensive coordinator Jim Schwartz, accused of Machiavellian machinations early in the season, delighted in his Pederson's strong-voiced commendation. "Pass this thing up there!" Schwartz said, and the big, silver Lombardi Trophy made its way from one man to the next.